You can change a text box's look, such as its background color, size, and border. Text boxes are great for labeling images since you can change each independently. Log in to your Website Builder. Click the text box you want to edit and click Settings. Besides setting the color with the first box, you can select Gradient to blend that color with a transparent block or second color. Click the little switch-block arrow to toggle the blend direction between vertical and horizontal. 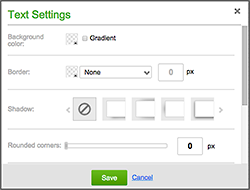 Click the box (set to transparent by default) to choose a color, click the middle arrow on to select a border style and then set the border width by entering a number in the px field. Apply one of four lighting effects to text box's edge. Drag the slider to the right to increase the rounding. Drag the slider to the right to make the entire box — and the text within it — more transparent. Drag the slider to the right to add more space around the text in the box. While you can resize the text box by dragging any corner, entering numbers in the Width and Height fields makes it easy to specify a particular dimension.